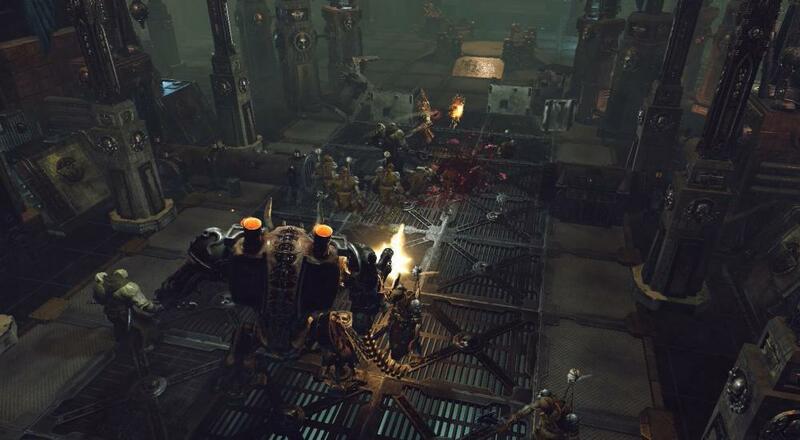 After a brief delay, Neocore Games' Warhammer 40,000: Inquisitor - Martyr has finally arrived on the PC (next month for the PlayStation 4 and Xbox One). We took the game for a spin last fall when it was still in Early Access, and it's definitely progressed quite a bit since then. If you missed our "Let's Play Co-Op" stream this week, enjoy the recap video below! While it's disappointing that the campaign is restricted to single-player only, there's still a lot of opportunities to enjoy some cooperative gameplay and fight the forces of Chaos with your friends. In fact, outside of those campaign missions that also double as a tutorial for all the different features and systems in Inquisitor - Martyr, all other missions can be completed with up to three other players online. This includes the custom missions you can create using "Uther's Tarot" (though it's worth noting all players need to have enough FATE [in-game currency] to to join), and the special assignment missions that are multi-step with choices to make along the way (only the host player can make choices, but they can narrate and let others vote on what to do). Players also have three different classes - Crusader, Assassin, and Psyker - from which to choose, and different specializations (ranged or melee) within those classes. I like a lot of what Inquisitor - Martyr and Neocore are doing. This definitely feels like the kind of game that lets players hop in and out casually if they want, while also accommodating those that want to sink their teeth into it. They recently announced their plans for what the endgame will be, and it sounds pretty intriguing as the end result will impact the game world in some way. That endgame will change each season and will increase max player level, add new loot, and other content. On top of that, Neocore stated earlier in the development that DLC will be released throughout the game's lifespan and players will have the option of buying it outright, or spending the FATE in-game currency (not purchasable) to acquire it; kinda like how World of Warcraft handles its monthly subscription. So, if Neocore can keep all this up, then there's a lot of potential here. There are, regrettably, some downsides that fit into two main categories: minute-to-minute gameplay, and player progression. In an attempt to capture the tactical feel of the Warhammer 40k universe, Neocore has implemented a cover mechanic where you can duck behind pillars and other environmental features in order to reduce the chance of getting hit by incoming enemy fire. Enemies can do the same thing and the end result is that you either A) have to destroy the enemy cover before you can shoot (if you're ranged) at them, or B) have to find new cover (if there is any) for your character because they suddenly can't shoot at the enemies from where they're at. If you skip the cover altogether, then you have to carefully kite enemies around so you don't get melted by their incoming fire. It's a noble goal to try and bring some of the ideas of the tabletop into this, but they just don't work. This becomes even more apparent when you look at the player progression. In most action-RPGs, you have an almost immediate sense of getting more powerful when you level up and skill points, or get new gear. Enemies take fewer hits than before or certain abilities now wipe out entire groups. The closest Inquisitor - Martyr gets to that is when you take on missions that are below your current power level (which increases based on the equipment you've got on) and you get a damage buff while all the enemies do less damage to you. The downside to taking on those easier missions is that you won't be as well rewarded with good loot as if you took on a harder challenge, which you'll definitely want to do as your gear not only determines your overall power level, but also what skills/abilities you can use. In addition, leveling up rewards you with a single (usually) skill point that you can drop into a few different skill trees, but it's not at all clear which tree you should be investing into in order to get the most "bang for your buck." This all adds up to some very slow progression that you really start to feel when you go up against your 10th mini-boss that soaks up your bullets like a dry sponge in a glass of water. I believe all of this can be addressed and fixed as Neocore receives more player feedback and goes through its first round of endgame content to see how stuff shakes out from that. I'll definitely be checking back in with Inquisitor - Martyr on a regular basis to see how it's progressed, but for now, I feel like it's a game that will cater to a specific audience rather than a broader group of action-RPG fans.